This is one of two pages at this site that look more closely at Voynich's acquisition of the Voynich MS. It was one of several manuscripts he acquired in 1911 or 1912, and it came from a larger collection of books and manuscripts. This page aims at reconstructing the set of manuscripts that he acquired, and looks at their origins. The parallel page concentrates on the questions where the manuscripts were preserved when Voynich acquired them (traditionally: Villa Mondragone in Frascati), and how he was able to find and buy them. There are occasional cross-references between the two pages, but both can be read independently, without having to go back and forth all the time. There is a third page that paints the historical background of this collection, which is suggested reading, but not absolutely needed to understand the present page. The first step is to present the sources that are available for this analysis. We will find that they are largely consistent, with only minor differences. We will also see that the group of manuscripts that Voynich acquired can be positively identified as a subset of a collection that was offered for sale to the Vatican library in 1903, a sale that was only completed in 1912. This collection traces back to the important Jesuit library of the Collegium Romanum. A comparison of all listed sources allow us to set up a 'maximum' list of manuscripts that may have been acquired by Voynich. This maximum list is presented as a table. Among this list there are several manuscripts of which the present whereabouts are unknown, and there are also some for which there is no evidence that Voynich ever owned them. It includes 20 manuscripts of which we can be certain that Voynich acquired them from the Jesuits. Many of these manuscripts can be traced back to earlier owners, and for three manuscripts we have reports that they were studied while they were in the Roman College of the Jesuits as late as 1870. Apart from these manuscripts, the larger collection that was for sale also included a number of early printed books (including some incunabula), but this page (at least in its present version) concentrates primarily on the manuscripts. Finally, some illustrations of several of the manuscripts that Voynich acquired are presented. While examining the manuscripts, with a view to the acquisition of at least a part of the collection, my attention was especially drawn by one volume. It was such an ugly duckling compared with the other manuscripts, with their rich decorations in gold and colors that my interest was aroused at once. The present page presents a reconstruction of the list of manuscripts that Voynich acquired. It is work in progress, and additional information is still being gathered. The location of the sale, usually assumed to be the Villa Mondragone in Frascati, and the general circumstances of the sale, are analysed on another page, that equally describes work in progress. Ruysschaert (1959) (2). This source was already identified many years ago, and in a footnote in its introduction the author refers to the acquisition by the book dealer Wilfrid Voynich of close to 30 books from the collection he is describing. Ruysschaert used previous work on this collection by E. Carusi sometime before 1926. 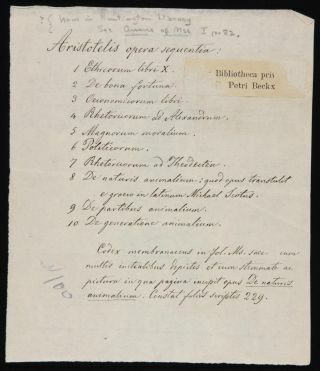 A handwritten catalogue of books and manuscripts that was prepared in 1903, apparently in preparation for the sale of these Jesuit books to the Vatican library. I have consulted a copy of it that is preserved in the archives of the Vatican Library. It was also an important source for Ruysschaert. A collection of 16 bibliographical paper slips preserved in the Beinecke library, which refer to many of the manuscripts that Voynich acquired from the Jesuits, and which were apparently removed from these books by him. Two publications by De Marinis, which are cited by Ruysschaert (see note 2). Additional information about the manuscripts acquired by Voynich has been obtained from modern on-line library catalogues and from several additional publications, which are cited when relevant. one Turkish MS (MS Vat.Turco 80). He further states that a book dealer named Voynich had acquired approximately 30 manuscripts out of the original collection, which therefore did not enter the Vatican library. Ruysschaert explains that the collection of Latin manuscripts that entered this library consists of two separate parts. The first derives primarily from the collection of Muretus (about whom more will be said further below), and this now constitutes the MS collection Vat.Lat.11414 - 11615. The second part is the MS collection of Lagomarsini (5), which now constitutes the MS collection Vat.Lat. 11616 - 11709. The manuscripts from both collections were mostly classical and humanist works from the 15th Century. A small attachment saying, in typescript: "Ex bibliotheca privata P. Petri Beckx"
A stamp saying: "Dono di Pio X"
Thanks to the on-going digitisation project of the Vatican Library some of these manuscripts can now be browsed online, which allows us to see these attributes, as will be shown further below. Petrus Beckx S.J. was the 22nd General Superior of the Society of Jesus from 1853 to 1887. He experienced some of the most difficult times of the Society of Jesus, including the expulsion of the Society from Rome in 1873, and the confiscation of the Society's possessions. In footnote 3 on p.vii of the introduction, Ruysschaert lists the manuscripts that he believes were acquired by Voynich, making reference for each item to De Ricci (1937) (6) and/or the two publications by De Marinis. The original which, according to Kristeller, should be in the Università Gregoriana has not been found, but Arch.Bibl.109 is a photographic copy of it. Its title page says: Catalogo di codici e stampe acquistate dalla Biblioteca vaticana nel 1903 or: catalogue of manuscripts and prints acquired by the Vatican Library in 1903. This is the same text as in the above description by Kristeller, except that he had the year (incorrectly) as 1913 instead of 1903. This catalogue has a total of 294 entries, of which 259 are of MS codices, 32 are prints, and 3 are duplications of other entries. Out of these 259 MS codices, 187 are identified (in the right margin) with an entry in Vat.Lat.11414 - 11615, 36 with an entry in Vat.Gr, and one with Vat.Turco 80. The remaining 35 items are either not commented on, or traced to an entry in De Ricci's Census (see note 6) or to De Marinis, who was also referred to by Ruysschaert. His relevant catalogues are described further below. Two of the printed books in the catalogue have also been included among Vat.Lat.11414 - 11615, presumably because they contain significant handwritten annotations (8). This shows that this catalogue only covers the MS collection that Ruysschaert described as 'from Muretus', while items Vat.Lat.11616 - 11709, i.e. the MS collection of Lagomarsini, are not included in it. Out of the 202 manuscripts making up Vat.Lat.11414 - 11615, 189 are included in the catalogue, which means that 13 are missing (6-7%). Among the Greek manuscripts (Vat.Gr. 2341-2390) 14 are not mentioned, and we may conjecture that these may also have come from the Lagomarsini collection. These 14 unreferenced manuscripts do not form a contiguous block of shelf marks. where the abbreviation means: codex membranacaeus saec. XV. It is the only item in the entire list that has neither author nor title (9). The right margin has a handwritten reference to the Census p. 1846 (see note 6), which lists the Voynich MS, also in accordance with Ruysschaert (1959). The catalogue says that the collection was offered for sale in 1903. 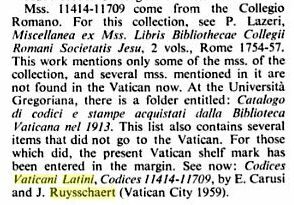 The manuscripts only entered the Vatican Library in 1912, however, as clearly stated in Ruysschaert (1959) (see note 2). I do not know to what extent such a long time span is unusual, and we may only speculate why and how Voynich was offered a chance to acquire some of the items. Mr. England, next-door in No. 70, was making a catalogue of the newly discovered printed books, and when I could I used to go in to see him and ask him to explain to me. Almost every book he showed me was a discovery, and was therefore unknown to bibliographers. Additionally, we read in a Kansas City newspaper clip that Voynich acquired early prints at the same time as this set of manuscripts. The 16 bibliographical paper slips now preserved in the Beinecke library were found by H. Garland in the London book shop after Voynich's death, at the time when the shop was being 'wound up'. Garland sent them to A. Nill in the USA. This must have happened around 1937 (11). The envelope in which he sent them is still preserved (12). Two examples of these slips are shown below. For the second, click on the picture for an enlargement. The paper slip that should have been attached to the Voynich MS has unfortunately not been preserved. Similar bibliographical slips may also be observed in the digitised manuscripts of the Vatican library (click on the thumbnail). It is clear that both sets of paper slips are from the same origin, i.e. the manuscripts used to be together in the same collection. According to Ruysschaert (13), the main text in ink dates from the 18th or 19th Century. As we shall see below, they were almost certainly written after 1849. While the scribe has not been identified, one likely candidate is the Jesuit librarian Paolo Beorchia. The small paper stickers saying "ex bibliotheca privata P.Petri Beckx" were most probably added in 1870-1873. The pencil annotations on the front of the slips preserved in the Beinecke library are in the hand of Anne Nill, and these must have therefore been made after 1937. Both Ruysschaert (1959) and the 1903 catalogue refer to two publications by the antiquarian book dealer and bibliophile Tammaro De Marinis (14). I have consulted both. The first, dated 1913 (15), is one of his sales catalogues of manuscripts and printed books, of which I own an original copy. This catalogue includes B/W plates of most of the manuscripts. As we shall see below, seven of the manuscripts in this catalogue can be traced back to the present collection, but W.Voynich is not mentioned anywhere in the catalogue, nor is the Collegium Romanum. The prices of these manuscripts are indicated in Lira, which was one of the currencies (together with the French, Swiss and Belgian Francs) united in the Latin Monetary Unit (LMU). In 1913 there were about 5 Lire (or LMU) to one US Dollar. One of these seven manuscripts is offered for sale for 1000 Lire (US$ 200), while four others range from 15,000 to 20,000 Lire (US$ 3000-4000). The remaining two manuscripts are indicated as 'sold', and fortunately we know that they were sold to Pierpont Morgan (Sr.) in New York. From correspondence preserved in the Morgan library (16) we know that Voynich received 300,000 Lire (equivalent with US$ 60,000 in 1912) for the pair (17)! None of the printed books in this catalogue can be traced back to the 1903 catalogue, i.e. to the Collegium Romanum. The second book by De Marinis, from 1947 (18), is a monumental multi-volume work, analysing the library of Alfonse, King of Naples and Aragon (1396 - 1458). Three out of the seven manuscripts from Voynich that were mentioned in De Marinis' 1913 catalogue trace back to the library of Alfonse and these three manuscripts are described in some detail in this book. Here, De Marinis also mentions that he acquired these manuscripts from the London book dealer W.Voynich. Interestingly, an appendix to this volume was written by Mgr. J.Ruysschaert, so we see that De Marinis and Ruysschaert knew each other. This is one plausible explanation how Ruysschaert found out that Voynich acquired some of the manuscripts that he later described in his 1959 catalogue. The 1903 catalogue has a handwritten table on the page labeled "B", where the Bibles and Breviaria are counted with stick figures, resulting in 6 resp. 2. There are two sets of bibliographical paper slips: those preserved in the Beinecke, from the manuscripts that Voynich acquired, and those still contained in the manuscripts in the Vatican. A comparison of these two sets shows us three things. The slips kept by Voynich originate with certainty from the same collection of manuscripts as the collection that is now preserved in the Vatican library. 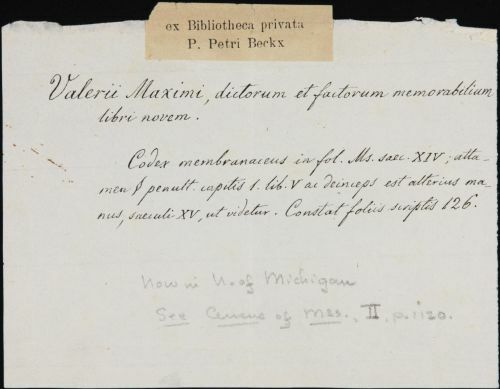 While on those preserved in the Beinecke library the name of P. Beckx is clearly legible, for those in the Vatican library the name has been erased in almost all cases. This coarse removal of the origin of the manuscripts must therefore have taken place after the two sets were split, i.e. after the sale to the Vatican. The implication of this erasure is discussed further in a section of the parallel page. Not visible in the above illustrations is, that on the reverse of these bibliographical slips (both in the Beinecke and in the Vatican) there are annotations in pencil. These are discussed in the parallel page, where the conclusion is that these are the original shelf marks from the Collegium Romanum library of the Jesuits. Each entry in the catalogue is a short description, usually just one line, and a comparison of these entries with the bibliographical paper slips clearly demonstrates that the person(s) who composed the catalogue (19) wrote these short descriptions by summarizing the entries on these paper slips. I have found no instance where any additional information is included in he 1903 cataogue. The catalogue entry specifies for each of the manuscripts whether it is parchment or paper, and from which century it dates (which is occasionally given as 'uncertain'). The following table shows a few examples of text on the bibliographical slip and in the catalogue. This allows us to suspect, though not with great certainty, that the paper slip of the Voynich MS would have specified that the MS was from the 15th Century. This is relevant, because it would have 'given away' that the Voynich MS is not likely to be a Roger Bacon autograph. So far, the information contained in the sources described above does not give us any irrefutable confirmation that the Voynich MS was included in this collection, even though there is no particular reason to doubt it. There is, however, another common feature of the two collections of manuscripts that allows us to confirm it. This is the standard cover that was given to almost the entire collection, while it was still in the Collegium Romanum library. The binding of the MS.
Ruysschaert briefly describes this rebinding of the manuscripts in his catalogue. Mrs. Christine Grafinger (20) of the Vatican library explained to me that almost all manuscripts in the collection have a similar, light-yellow parchment binding, and she confirmed that the cover of the Voynich MS is very similar. The above-mentioned links to the digitised manuscripts in the Vatican library can be used to judge this for oneself. The style of the binding is exactly the same, and this is not just true for the Voynich MS, but also for most of the other manuscripts acquired by Voynich. In a >>blog entry of the Historical Archives of the Gregorian University (in Italian) we read how a large collection of Jesuit manuscripts was rebound, probably between 1824 and 1870, since they were "infested by worms". This appears to be the explanation for the consistent set of covers. The Voynich MS has certainly been affected by woodworms, and MS conservators have derived from this that its original cover was of wood covered by leather. The same insect damage is clearly visible in least one other MS acquired by Voynich: a Boccaccio MS now at the University of Chicago (MS J14 in the following). Whether the slip has been preserved and whether it has the P.Beckx sticker. The 16 manuscripts for which this is the case are at the top of the table. Two parts, separated by a / . The first part (if present) gives additional information from the description of the MS. The second part is a marginal reference added later (possibly by Ruysschaert) identifying the MS with an item in De Ricci's Census or in De Marinis. A forward reference to the ID of this MS in Table 2 (further below). Aristotelis opera sequentia: [...] Shown above. Valerii Maximi, dictorum et factorum memorabilium libri novem Shown above. Virgilius P.M., Opera - - / Census p.886? Ruysschaert lists approximately 30 items of which he suspects that they were acquired by Voynich. However, from Voynich we have only 16 paper slips (21). The 1903 catalogue includes 35 entries for manuscripts that are not traced to the Vatican library. Combining all this information results in a list of 38 possible items. It is of course possible that some of these items were not purchased by Voynich but by someone else, and at least one of them is rather likely to be a mistake in the 1903 catalogue (22). The minimum number of manuscripts that Voynich certainly acquired is 16 (from the preserved paper slips) plus one for the Voynich MS itself, so we can be certain that there were at least 17. It is also certain that some more paper slips of manuscripts acquired by Voynich must have been lost. One such case is a pair of manuscripts originating from the library of Matthias Corvinus. These books have been together from the time they were in Hungary until the present time, yet the paper slip of only one of the two has been preserved. This is addressed further below in specific note 1. Another interesting example is a MS of Marcanova sold by Voynich in 1924, which was identified independently as originating from the Collegium Romanum. Its paper slip has also not been preserved and it is addressed further below in specific note 2. A third additional MS of which we can be certain that Voynich acquired it is called "Constitutiones Venetae". It is listed in the 1903 catalogue, where it is marked as missing, and it appears in De Marinis (1913). This brings the total to 20. Three of the items that were certainly acquired by Voynich are missing in the 1903 catalogue, namely an Aristotle MS for which the slip has been preserved (see specific note 3 below), and the two items mentioned in the previous paragraphs (one Corvinus MS and the Marcanova MS). The last two were, however, listed by Ruysschaert. Two other items, which are not listed by Ruysschaart but for which the paper slip has been preserved by Voynich (J29 and J35), can be found back in the catalogue. From the above analysis, and a direct inspection of De Marinis (1913), it appears that the following items in it definitely trace back to Voynich's acquisition from the Jesuits: Nos. 2, 6, 10, 11, 14, 15 and 23. Of these, Nos. 2, 6 and 23 are also described in more detail in De Marinis (1947). Of the 32 printed books in the catalogue, 23 are not traced to the Vatican library, so this would be the maximum nr. that Voynich could have acquired in addition. We don't know if the Lagomarsini collection included any printed books. None of the printed books in De Marinis' 1913 catalogue matches any of the 23 titles of missing prints. Voynich's own catalogues have not yet been consulted. Following are some more specific comments about some of the manuscripts and their tentative identifications by A.Nill and Mgr. J. Ruysschaert, especially highlighting some issues and inconsistencies. The pair of manuscripts denoted J20 (Cicero) and J22 (Didymus) both originate from the library of Matthias Corvinus. These books must have been together from the time they were in this library until the present time. They were taken to Rome and certainly ended up in the Jesuit library in the Collegium Romanum. They were seen there in 1869 by the Hungarian historian Flóris Rómer, and photographed on his request in 1870 (23). Voynich sold them to De Marinis, and his partner Forti first tried to sell them back to Hungary, where these manuscripts were well known since Rómer's publication. However, already in July 1912 they were sold through Alexandre Imbert to John Pierpont Morgan. The paper slip of the Cicero MS has been preserved, but that of the Didymus MS has not. However, both paper slips were seen and transcribed by Rómer (24). The Didymus MS is also missing from the 1903 catalogue, but it is described in detail in De Marinis (1913) and Ruysschaert also included a reference to it. (This is in line with the suggestions that he 1903 catalogue was composed from the paper slip descriptions, and that Ruysschaert obtained information about the manuscripts involved from De Marinis). The famous Marcanova MS (J30) was sold by Voynich to Robert Garrett in 1924. By 1927 it was identified as originating from the Collegium Romanum library (25), where it had been seen by several people until the year 1873, after which it disappeared. It is not listed in the 1903 catalogue and its paper slip has also not been preserved (26). Ruysschaert still mentioned it in his publication. Of the Aristotle MS (J03) the paper slip has been preserved, so it certainly originates from the Collegium Romanum library, and it was equally certainly acquired by Voynich. However, it is not listed in the 1903 catalogue, and it has completely escaped Ruysschaert's attention, even when the MS would have been of great interest for him (27). This could just be an oversight in the 1903 catalogue, of which we already saw that approximately 6% of the books now in the Vatican Library are missing. The fascinating history of this Aristotle MS is described in more detail in a dedicated page. Ruysschaert identifies the Alfraganus MS (J02) with MS 1 in the Estate of W.Voynich (De Ricci p.1845). This is, however, problematic, since that MS has size 21 x 15 cm and 163 ff. The paper slip refers to a MS in quarto with 154 written folios. The annotation of Anne Nill on the paper slip says: "Voynich M 7111". MS 1 from the Estate of W.Voynich was later sold to the Columbia University of New York, where it is now preserved as Smith Western Add. MS 06. Because it includes an old italian land ownership note, there is no doubt that this MS in Columbia University is the same as MS 1 in the Estate of Voynich. There is extensive correspondence in the Grolier club about an Alfraganus MS, between Anne Nill and Francis Carmody (Univ. of California Berkeley), early 1945. From this, it appears that a related MS was acquired from Voynich by Garrett, and is now known as Princeton Garrett MS 99. The latter is however certainly not the Alfraganus MS of Collegium Romanum. From this correspondence we can conclude, however, that also Anne Nill believed that the Collegium Romanum MS is identical with MS 1 of the Estate, due to repeated references to Voynich M 7111. Ruysschaert identifies the Alfonsine astronomical tables (J03) in his 1959 publication with MS 2 of the Estate of W.Voynich. However, the pencilled note in the margin of the 1903 catalogue refers to the Census, p.1899. This would indicate Princeton MS Kane 51. At present, it is not clear which one is correct, and the present whereabouts of MS 2 of the Estate of W. Voynich is also not known to me. The Mantuani MS (J29) is described in great detail in a publication by Daniel Pócs (28). From this we learn that the MS is now preserved as Cod.Lat.445 in the National Széchényi Library in Budapest, and has been identified as a Corvinate. It was purchased in Paris in 1912 by the Hungarian art collector Lajos Ernst. Already in 1912 the MS showed damage from a fire, which can be associated with a fire in the Collegium Romanum in 1849. Given that the first pages of the MS are strongly affected, while the bibliographical slip still preserved in the Beinecke is not, Pócs argues convincingly that this slip (and consequently the others) must have been written and added after 1849. My search for the present whereabouts of the Cicero MS (J19), which has so far been unsuccessful, is described here. With the aid of De Ricci (1937) (see note 6). and modern library catalogues, either online or in printed form, most of the manuscripts that were acquired by Voynich can still be identified in libraries today. A table below shows the result of this exercise. It is work in progress and there are still numerous uncertainties. It was mentioned before that there are 20 manuscripts of which we can be certain, and these are highlighted in the table, which is sorted alphabetically by author. There are other manuscripts of which we can also be fairly certain, because they are listed in the 1903 catalogue, and a corresponing MS was sold by Voynich to the holding library shortly after 1912, but these have not been counted. My identifier for this MS. It is highlighted in case this is one of the 20 certain manuscripts. Any known owner before the MS entered the library of the Collegium Romanum. These are briefly discussed below the table. The table uses the same abbreviations as the first table. Alfraganus: Astronomia 13th cent; mem. in quarto, 154 ff. - Uncertain See specific note 4 above. J03 Alfonsus: Tabulae astronomicae 15th cent; mem. - Uncertain See specific note 5 above. (Anon) Constitutiones Venetae 16th cent; mem. in quarto - Unknown Interesting for its beautiful binding. J07 Th. Balsamon: De sexta sinodo 16th cent; chart. - Unknown Uncertain whether ever owned by Voynich. Biblia Sacra 14th cent; mem. in octavo, 597 ff. - Unknown (30). See also (31). J19 Cicero: Officiarum - Cato Maior Laelius, Paradoxa (unc); chart. - Unknown See specific note 6 above. J27 St. John Chrysostom: Homilies on the acts... 1150; mem. 38 x 26 cm, 424 ff. (in Greek) - Univ. Michigan, William L. Clements Library Shelf mark: MS 14? uncertain. J. Baptista Mantuanus Carm. : Parthenice, sive de laudibus BMV carmen 15th cent; mem. in quarto, 69 ff. Matthias Corvinus Széchényi Library, Budapest, Cod.Lat.445 See specific note 7 above. Marcanova: Antiquitates ca. 1473; mem. 36 x 26 cm, 209 ff. M. Antonius Muret Princeton: Garrett MS 158 See specific note 2 above. (31). J33 M. Ritius: de regibus Gallorum etc. 16th cent; chart. - Unknown (see note 22). It of interest to note that approximately half of the manuscripts that was offered for sale by the Jesuits was on parchment and half on paper, as indicated in the 1903 catalogue. Voynich, however, clearly preferred parchment manuscripts, because among the set he acquired only one appears to have been a MS on paper, or more specifically a mixture of parchment and paper, namely one of his favourites: the Valturius MS (J36). King of Spain and Naples (1396 – 1458), who possessed a very rich MS library. This has been described extensively in De Marinis (1947) (see note 18). Three of Voynich's manuscripts originate from his library (i.e. before they entered the Collegium Romanum library), and at least one more is now among Vat.Lat.11414-11709. Duke of Ferrara and Modena (1413 – 1471). The Biblioteca Estense (Estense Library), was the family library of the dukes of Este. Dating at least to 14th century, it was largely enriched during Ferrara's Renaissance, and finally established in Modena in the beginning of 17th century. The reference to the Dukes of Modena and Ferrara by Voynich in his 1921 publication (see note 1) refers directly to Borso. (See also below, MS J17). Sigismondo Pandolfo Malatesta (1417 - 1468). King of Hungary (1443 - 1490). Founder of a famous humanist library that was dispersed after his death. Many of his manuscripts have been lost, or are at best untraceable. The surviving Corvinus manuscripts spread over Europe have been object of intensive study by Hungarian historians, and the items in the Collegium Romanum library were already described and photographed before the confiscation by the state. Physician to Lorenzo il Magnifico (~1440 – 1492). Three of the manuscripts acquired by Voynich come from his library, plus the following among Vat.Lat.11414-11709: MS 11433, 11496, 11504, 11520, 11575, 11576, 11581, 11585, 11600, 11610 and 11612. Leoni's library was first researched by Dorez (33), who found a catalogue of it, but none of the manuscripts. That discovery was achieved by Ruysschaert based on the collection that is the subject of this page. This is described in great deail in Ruysschaert (1960) (34). Ragusa is modern Dubrovnik. Beside the one MS acquired by Voynich, there are four more of his manuscripts among Vat.Lat.11414-11709. All five of these were owned by Muret (see below) before they entered the Collegium Romanum library. The large library of this famous French humanist (1526-1585) was donated to the Collegium Romanum some time after his death. Three of the manuscripts acquired by Voynich, and a large number among Vat.Lat.11414-11709, trace back to this library, including the library's catalogue of books issued before 1585 (Vat.Lat. 11562). Other manuscripts that were owned by Muret are now in the archives of the Gregorian Library (APUG) and many of his printed books are in the national library of Rome (BNCR). Among the manuscripts acquired by Voynich only the Voynich MS traces back to Kircher, but in the overall MS collection of 380 volumes there was at least one other MS that used to belong to him. This is now in the Vatican library, MS Vat.Lat.11698, described in detail by Ruysschaert. That means that this second Kircher MS was in the Lagomarsini collection. Other manuscripts that used to belong to Kircher have been dispersed along various collections. This is analysed in more detail in a section in the parallel page, which also includes a graphical representation of this dispersion, showing the path of the Voynich MS from Kircher to Voynich. As seen in the introduction, Voynich described the collection of manuscripts as "a most remarkable collection of preciously illuminated manuscripts" and further refers to them as "with their rich decorations in gold and colors" (contrasting to his "ugly duckling"). The following links to on-line images of some of these manuscripts may illustrate this, in particular the two Corvinus manuscripts (J20 and J22). It is worth noting that, among the manuscripts now in the Vatican library, I have so far not seen any that have any significant illuminations. The illustration of f4r of MS J17 is of interest as this shows the arms of Borso, Duke of Ferrara and Modena, which Voynich highlighted in his 1921 publication (see note 1). 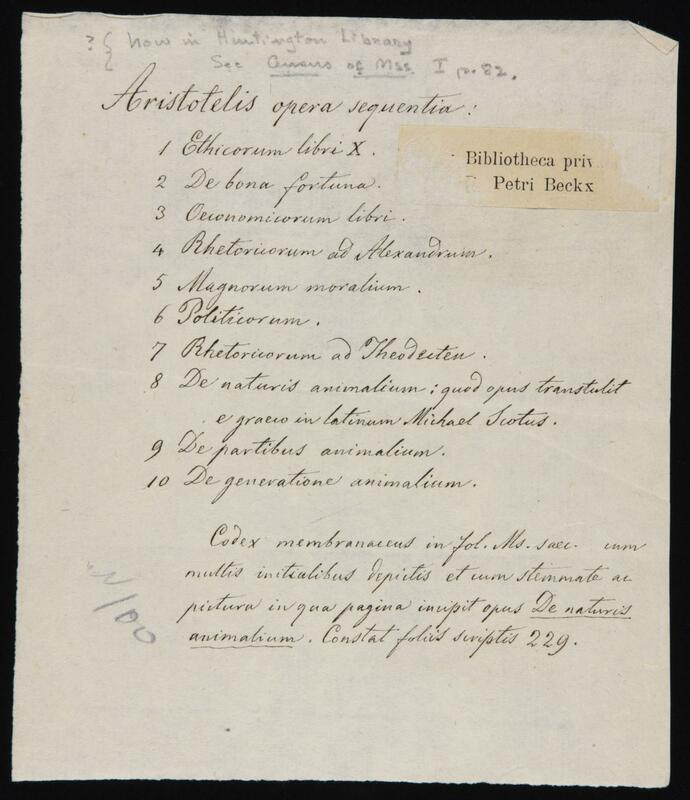 I would like to acknowledge the very helpful support in these investigations from APUG (Rome, Historical Archives of the Pontifical Gregorian University/ Roma, Archivio storico della Pontificia Università Gregoriana). Illustration of the paper slip of the Aristotle MS shown with kind permission from the Beinecke Rare Book and MS Library in New Haven (CT). I am grateful to the various libraries who make available digital scans of their manuscripts in the table above, and to the Vatican Library / Bibliotheca Apostolica Vaticana for the digitisation of several of the manuscripts among Vat.Lat.11414-11709. Ruysschaert (1959), see also a partial transcription. See also: Bignami Odier (1973). He also mentions Vat.Lat.13479, but this appears to refer only to the donation by Pius X, not its origin from the Collegium Romanum. Hieronymus Lagomarsini S.J. (1697-1773) was a professor at the Collegium Romanum, and famous for his critical edition of the complete works of Cicero. Most of his manuscripts are Cicero texts. Namely Vat.Lat. 11535 (De S. Victore) and Vat.Lat.11602 (Hilarius Pictaviensis). It is somewhat unsatisfactory not to see any reference to the unknown writing. On what basis Ruysschaert decided to make this identification is not yet understood, and further research in the papers of Carusi might be enlightening. In any case, the anecdote reported by Kraus further clearly suggests Ruysschaert's conviction about the identity of this MS.
E. Millicent Sowerby (1967) (pp.13 and ff.). She describes one of Voynich's European "hunting trips" shortly before she joined the staff, which was in December 1912. I am grateful to J. Speel for providing the closing date of the London shop. It is in the Beinecke Library, and it has several useful annotations from Anne Nill. Ruysschaert (1959), introduction, p. ix. I am grateful to William M. Voelkle of the Morgan library for this information. With an inflation factor from 1912 to 2018 of 26, this would be equivalent with just over 1.5 million dollars in modern currency. De Marinis (1947). I am grateful to the Library of Congress for an opportunity to consult this monumental work. Several different hands can be identified. In a private communication in 2014. A statement made by Kraus (see here) may lead us to believe that there may have been 17 of them around 1960. The entry for Ritius (J33) is the first one in a different hand, and seems to refer to the same MS as one described two lines above. Three other duplicate entries exist in the catalogue, but these have been marked as such. Something seems to have been written in the right margin, but it has been erased. They have been transcribed in MS Fol. Hung. 1110/I in the National Széchenyí Library in Hungary, fol. 304r-325r. See Pócs (2017), where they have been reproduced. van Mater Dennis (1927). I am grateful to Rich SantaColoma for the reference. It is possible that this MS, and other manuscripts acquired by Voynich, actually come from the collection of Lagomarsini. I also still need to find out whether the Lagomarsini collection also had the paper slips with the bibliographical descriptions. That the MS was originally in the Muretus library does not prevent it from ending up with Lagomarsini. Another book with Latin inscriptions, from the collection of Kircher, equally ended up with Lagomarsini and is now MS Vat.Lat.11698.